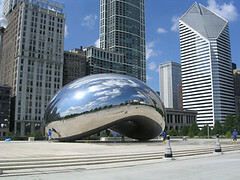 Just spent a weekend in Chicago at the LEAD conference put on through NASSP. It was our first time in Chicago and the students first time at a LEAD conference. As with all conferences, there’s good and bad; things to aspire to, things to learn from, things to put into action. This was the inspirational backdrop behind the keynote address from Ed Gerety: focusing on being an individual, leading to the value of pursuing your dreams, ending with the importance of promoting this in others. It was a reminder that no one lives in a bubble. A reminder that actions have a ripple effect. Inspiration & aspirations are great, but if these ideas do not become actions, what’s the point? Character isn’t a state of mind. Service isn’t in theory. Good intentions simply do not produce results. This, from the perspective of the adult, was the biggest disappointment of the conference: the lack of substance. Our group attended sessions on ice breakers, fundraising, club organization and officer training. And they were pumped and excited by the interaction with the other students from around the country and the speakers, but this exuberance wasn’t leveraged. There was nothing on how to make a difference. It’s not that a step-by-step guide needed to be provided, just something that could serve as scaffolding, something related to service learning, something tangible as the source of inspiration. In essence, lessons learned from successful (& unsuccessful) service projects – what went right and, especially, what went wrong. How did an individual, a group, make difference? What groups did they partner with and why? What did they do to get a whole school to buy-in to a project? How do they choose their projects? How will they build on previous success? This, for me, represents the shortcomings, a blind spot, in the national organization. Honor society, at its heart, is a service organization. The motto, noblesse oblige, puts the focus wholly on the duty of the fortunate to help those less so. Yet, this aspect, not ignored exactly, is certainly not front & center; it’s an aside, a component certainly, but not the point. Of course, I do realize I’m tilting at windmills to expect all teenagers in honor society to want to help others, to want to give back, to want to be involved. A few do; most try to do the least required. I do see the irony in having a required number of service hours (thus defining what’s good enough, i.e., the least required) and playing on the desire of most to have this as a line listed in the resume or college application. There is an exclusionary status associated with membership and that, ultimately, is the hook. The carrot to prod action in hopes that awareness is developed and inspiration found and both lead to doing something to change the world for the better. After all, membership shouldn’t be in name only. Noblesse oblige shouldn’t be an empty motto. Inspiration, though required, isn’t the goal. Good intentions aren’t good enough. A step must be taken, impact must be sought. This, really, is what I’d like to see as the next conference’s focus. Inspire, absolutely; but also teach, discuss, and show how one person, one small group, can make a difference. Make the ideal tangible and more than words only.